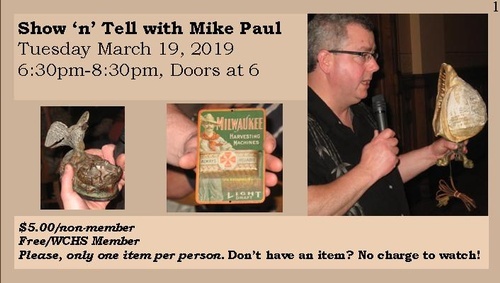 Dig out your family treasures, dust them off, and bring them to Show ‘n’ Tell with Mike Paul. Mike Paul is a professional appraiser and auctioneer of Paul Auction Company, Inc. in Kewaskum. Mike will share his incredible knowledge of antiques with the audience as he examines each piece. Even if you don’t have anything to share, this evening is fun & informative. $5.00/non-member. Free/WCHS Member. Please, only ONE ITEM per person. Don’t have an item? There’s no charge to watch. Contact Hannah - education@historyisfun.com or (262) 335-4678.